Hurricane Sandy was one for the record books. The storm, which resulted in the deaths of at least 75 people in the United States, is the largest hurricane to ever form in the Atlantic basin since record keeping began in 1851. In addition, it's estimated that Sandy could have caused $50 billion in economic losses. 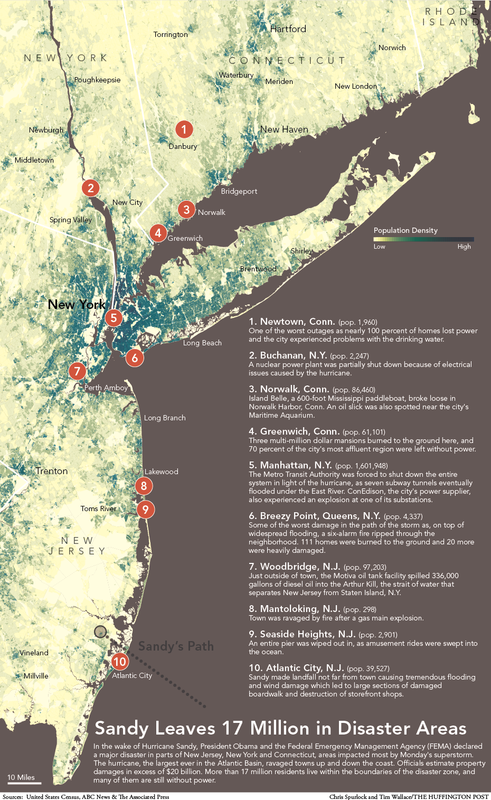 Sandy leveled a direct hit at the most densely populated stretch of the East Coast, of which large areas have since been declared FEMA Disaster areas. An estimated 17 million people are in the FEMA-designated disaster areas. Within those disaster areas, the "Frankenstorm" resulted in unprecedented storm surges, widespread power outages and firestorms that destroyed up to 100 homes. Stories of heroism have emerged amid the destruction, however, and donations have poured in. If you want to help contribute to the relief effort, be sure to read our tips for donating smart. Read our LIVE BLOG for Hurricane Sandy updates.